St. Michael Catholic Church was established on July 20, 1977, by Bishop John J. Cassata. Rev. James R. Miller was appointed the first pastor. On August 1, 1977, the rectory on Marlene Street was purchased, and the first Mass was celebrated in the rectory, with approximately 30 people in attendance. The first Sunday Mass for the new parish was celebrated on August 14, 1977, in the cafeteria at Harwood Junior High School, in Bedford. 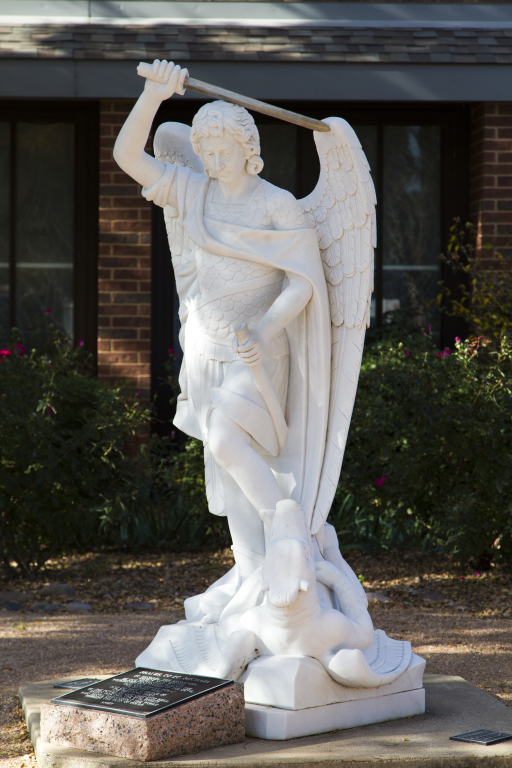 Originally named the Bedford-Euless Catholic Community, the parishioners took a vote and chose St. Michael as its patron. The congregation for the new parish came mainly from St. John the Apostle in North Richland Hills, and Holy Family in Irving. By the summer of 1979, the number of faithful had grown to 510 families and a multi-purpose building was erected on land purchased for the parish. St. Michael Catholic Parish made plans in 1982 to construct a church and classrooms. 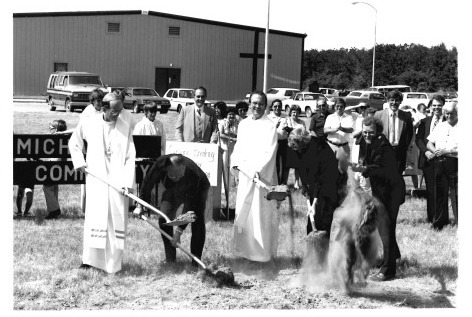 The new St. Michael Catholic Church was dedicated on September 28, 1985. The church, with seating for 800 people, included an education wing, 12 classrooms, and nursery facilities. It also included an administration wing which is now the Pastoral Offices. 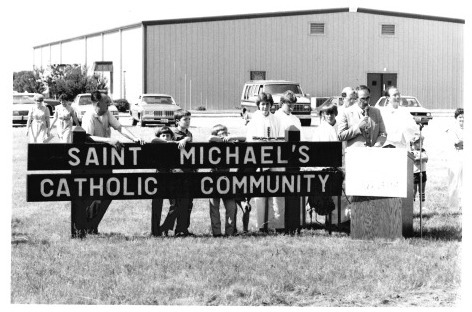 In 1997, as St. Michael, once again, outgrew its facilities, plans were prepared for the Formation Center, with additional offices, meeting rooms, and youth facilities. On Pentecost Sunday, 2009, we began celebrating Mass in Spanish at our 1:00pm service. Attendance at that Mass continues to prosper, as do our ministries that serve the Spanish speaking community. Also, in 2009 our first Tongan Deacon was ordained. Deacon Sangote helps to better serve our Tongan members of the community. In June, 2011, we added a weekly Spanish Mass every Thursday at 6:30pm. Through the guidance of our Facility Renewal Committee and many others, our parish welcomed the newly remodeled kitchen and Great Hall in October, and park facilities, with a large parish garden, on the north end of the property. We welcomed Father John Swistovich, who was installed as Pastor by Bishop Kevin Vann, on December 18, 2011. In early 2014, two of our former parochial vicars were named Bishop. Bishop Michael Olson became the 4th Bishop of the Diocese of Ft. Worth, and Bishop Steve Berg became the Bishop of the Diocese of Pueblo, Colorado. 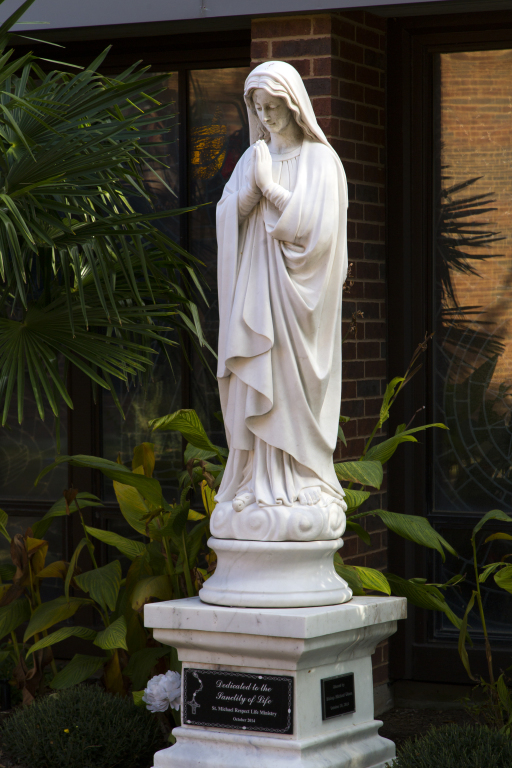 Through the generous donations from parishioners, we were able to erect statues of our Blessed Mother Mary and our patron saint, St. Michael the Archangel, within our outdoor gardens, in September of 2014. In November of 2015, the Flower and Vegetable Garden Ministries were proud to announce that St. Michael had received the Bedford Beautification Business Award. In 2017, a beautiful new tabernacle was installed in our main Sanctuary and blessed by Bishop Michael Olson. In 2017, St. Michael proudly celebrated its 40th Anniversary. At the St. Michael Feast Day Celebration in September, all the past clergy were invited and recognized. The City of Bedford Mayor, Jim Griffin, presented the 40th Proclamation. Now one of the largest Catholic communities in the Diocese of Fort Worth, St. Michael has more than 3,000 registered families as part of this dynamic parish.